Looking to switch up your protective styling game? How about a new professional natural hairstyle? 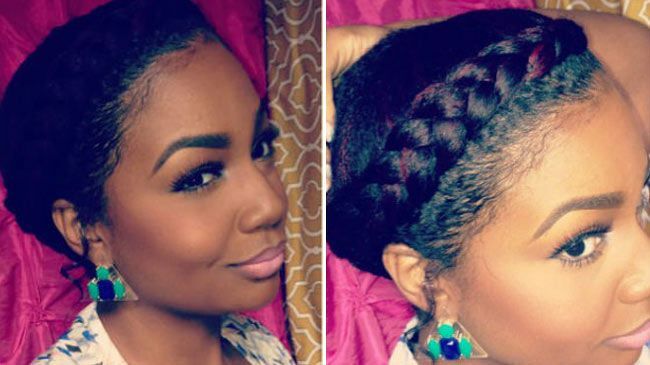 This is goddess braid doubles as both a chic style and a great protective style for short natural hair. MsDanti walks us through the easy steps with her tutorial. Make a deep side and crown part. Slick down your edges with a gel like Ecoco Moroccan Argan Oil Styling Gel or As I Am Smoothing Gel. Distribute hair butter throughout you hair for added shine and protection. We like Roots of Nature Butter Whip Coil Cream. Start braiding your hair from the parted side to the other side of your hair. Stay close to your edges. Braid all the way down to the back. Repeat steps 2 through 7 on the other side. Cross the two braids in the back and secure them with bobby pins.